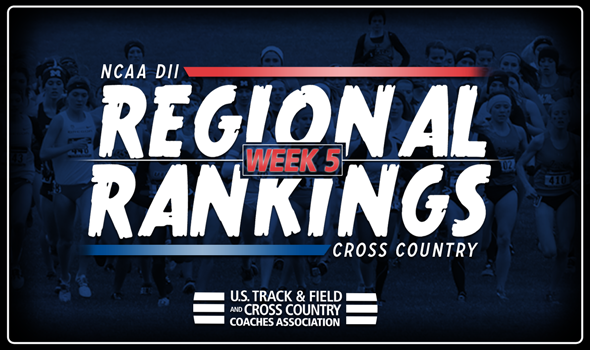 NEW ORLEANS – A few cross country meets from this past weekend caused shifts amongst the top-three teams in the NCAA Division II Cross Country Regional Rankings, announced the U.S. Track & Field and Cross Country Coaches Association (USTFCCCA) on Tuesday. A total of four regions – two men and two women – saw their top-three change after a weekend of action. Two of those regions even saw a new team overtake the top spot. For those who don’t know, the USTFCCCA Regional Cross Country Rankings are determined subjectively by a single member coach in each respective region. The regional representative is tasked with weighing returning teams’ strength with current season results (if applicable) in determining predicted team finishes at the NCAA Regional Championships. The head honchos in the Atlantic Region held onto their spots in both the men’s and women’s rankings after a busy weekend. Shippensburg, Edinboro and Indiana (Pa.) went 1-2-3 on the men’s side with all three having competed this past weekend. Shippensburg won the Carnegie Mellon Invitational with Dominic Stroh, Calvin Conrad-Kline and Harrison Schettler finishing as the top three runners, respectively, at the meet that featured 20 teams. Edinboro had a solid showing at the Lewis Crossover and Indiana (Pa.) finished fourth at the Carnegie Mellon Invitational while running without its top two runners. On the women’s side, Edinboro remained in first, while Shippensburg (second) and California (Pa.) (third) rounded out the top-three. Edinboro’s women placed 13th at the Lewis Crossover and Shippensburg was the top NCAA Division II finisher at the Carnegie Mellon Invitational. California (Pa.) was idle. The big change in the Central Region came from Lindenwood’s men’s program, who jumped up two spots to second place. The Lions defeated five nationally-ranked NCAA Division II teams at the Lewis Crossover, finishing fourth overall. Augustana (S.D.) and Central Missouri remained in first and third, respectively. The top-four women (Pittsburg State, U-Mary, Oklahoma Baptist and Augustana (S.D.)) held down their respective spots from a week ago. Minnesota Duluth (fifth) and Fort Hays State (sixth) each rose in the rankings, with the latter of the two jumping four spots after a fourth-place finish at the Fort Hays Open. The men’s portion of the East Region went through a ton of change, while the women’s side went unscathed. Stonehill overtook American International for the top spot in the men’s rankings after becoming just the second NCAA Division II team in 60 years to win the All New England Championships. James Murphy (fifth) and Riley Dowd (ninth) finished in the top-10 for the Skyhawks. American International finished 11th at that same meet, despite a first-place finish from Leakey Kipkosgei. Southern New Hampshire moved up to third in the rankings after Tyler McLaren was the runner-up to Kipkosgei in Boston this past weekend. Stonehill, Assumption and Roberts Wesleyan remained in the top-three spots in the women’s rankings. Walsh shook things up a little bit in the women’s rankings of the Midwest Region with a two-spot jump to second behind Grand Valley State. The Cavaliers posted a fourth-place finish at the Lewis Crossover behind three NCAA Division II powerhouses. Hillsdale slipped to third, while Northern Michigan leapt three spots to fourth to return to where they were to open the season in the Midwest. GVSU, Southern Indiana and Lewis went 1-2-3 in the men’s rankings for the third-consecutive week. The South Region was relatively unaffected after a week of action, as the top-six men’s and top-seven women’s spots were identical to last week’s rankings. Lee (Tenn.) and Alabama Huntsville were idle on the week, which allowed them to hold down the first and second spots in the men’s rankings, respectively. Saint Leo competed at the Disney Classic and remained in third. The women of Lee (Tenn.) also stayed in first after an idle weekend, while Saint Leo’s third-place finish at the Disney Classic kept the Lions in second. Alabama Huntsville rounded out the top-three in the women’s rankings. The state of Colorado owned the South Central Region once again. Adams State claimed the top spot in the both the men’s and women’s rankings as they’ve done all season. The men’s Grizzlies were followed by Colorado Mines and CSU Pueblo, who were both idle. Western State is fourth in the men’s rankings after winning the Fort Hays Open. On the women’s side, Western State and Colorado Mines are second and third for the second-consecutive week. Colorado Mines jumped into third last week after coming in at fifth the week before. Not a single thing changed in the top-10 of the Southeast Region on the men’s or women’s side. Nada. Zip. Zilch. The men from Mount Olive and Queens (N.C.) were idle, remaining in the first two spots of the rankings, while Augusta competed at the Bobcat Invitational to stay in third for the fourth-straight week. Joining the three aforementioned teams in the top-five for the fourth week in a row were UNC Pembroke (fourth) and Anderson (S.C.) (fifth). The Lancers of Cal Baptist broke into first place in the women’s rankings of the West Region for the first time on the season after winning the Lewis Crossover. Emeline Delanis (third), Fruzsina Ladanyi (fourth) and Leanda du Bruyn (fifth) all finished in the top-five of a meet that featured 353 competitors, keeping Cal Baptist undefeated on the season. Simon Fraser fell one spot to second while Chico State (third) jumped one spot and Alaska Anchorage (fourth) moved up two to round out the top-four. On the men’s side, Chico State, Cal Poly Pomona and Cal Baptist retained their spots in the top-three, while Western Oregon moved into the top-four after an idle week.